Environmentally friendly, this two-part chemically setting caulk is recommended for use inside the nose of all rubber and vinyl stair treads. 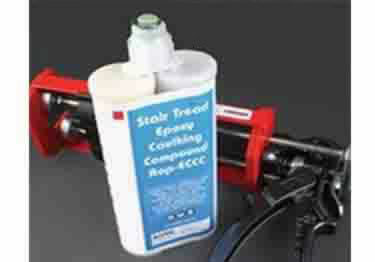 Additionally, it can be used to fill voids on worn or broken steps to provide support. Spread Rate: 1/2 in. bead of approx 40 lin. ft. per two part quart unit, 1/4 in. bead of approx. 50 lin. ft. per dual cartridge. I have purchased service weight vinyl stair treads to go over wooden stairs. Some of the stairs have damage from the mover's dolly (up to 3/8 inch deep, 3 inches wide). Will this caulk be sufficient to fill the void, or do we need to repair with wood putty before installing the stair treads? I bought the quart and I see in another answer that you mix it and apply it with a putty knife. Not really sure how you would do that on an inside square corner of a stair tread with a putty knife - is there a video? I will be buying 13 square nose stair treads, but I'm wondering how much will I need, and what would be best if I wish to do a couple stairs a night....without the product going bad? Also, does the quart can appication come with both parts? And what does the smaller bottle do? I will be installing them on wood. I only have 10 round nose 36" wooden stairs to do and the gun method seems expensive for a one-time use. Do I need epoxy for round nose? Is the quart can the same stuff? In the picture what is the smaller container used for and do I buy it also? Do I apply both adhesive and epoxy to the round noses of stair and tread? Thank you. do you have to use the whole quart in one use - are the cartridges resealble? How many days shipping when ordering for Oregon location? is this product good for outside wooden stairs? Rubber/Vinyl Epoxy two-part chemically setting caulk is recommended for use inside the nose of all rubber and vinyl stair treads. It's got a strong hold and it worked perfectly. Thank you for your review. We are very pleased everything went well with your application. If you ever have any questions, please don't hesitate to give us a call. Bought this caulk to install Roppe rubber stair treads and it worked as described. Thank your for your review. We are very pleased we met your expectations. If you have any further questions, please don't hesitate to give us a call. First i'd say that Koffler cust service is great, they answered all my questions... This caulk stuff is really awesome. I ended up using the caulk as adhesive too and the rubber treads stick directly to the cement /tile. It is work as the stuff glops out, maybe there is some other way, but given i only had a few to do it was fine. I used the can, mixed and applied with patience, taped everything off to reduce mess and cleaned up with alcohol before it dried. It was gooey and messy but works great!! I then poured the leftover caulk into a gap in my laminate and it filled that as hard as a rock! i am very very happy with this product. Don't have a frame of comparison. We got all the injector and mix tubes ok. Stuff went on fine. I thought the product was expensive. We meant to order the glue also and somehow forgot it, had to get it locally. I would be interested to see what nose caulk would have cost locally. The product worked as indicated. Did not think it would cover as advised but it did. I noticed that there is a single caulk tube product for this purpose. That was not offered? That would have saved $100+ for a special gun that I will never use again. Bought cartridge and dispenser, but did not receive any mixing nozzles! No listing on site to buy nozzles??? Bought this stuff based on the website recommendation, but it didn't work out too well. Got the quart size tub with separate hardener. Directions said mix it ALL, which I did, and then tried to figure out how to apply the gooey stuff to the inside corners of the stair treads. Impossible. No putty knife or any other tool I could think of would do it. Wound up just using a finger, but by now the mixture was curing (heating up and getting stiffer by the second). Estimate the working time after mixed was only about 5-10 minutes and then it turned solid in the tub. Not NEAR enough time to do 12 treads, even if I could figure out how to apply it. So. If you're gonna use this stuff, better get the dual cartridge kit with the gun. Maybe you could lay down acceptable beads. Or, if you get the tub, just mix small batches and apply it to the ege of the stair itself instead of the inside of the stair tread. Directions could have been better, and for sure the cure time needs to be extended somehow. We are sorry that this happened. In looking over the installation instructions it's possible that you may have exceeded the 30 minute working time. Also, it's possible that you may have exceeded the recommended mixing time or mixing speed. If you would like us to send you additional nose caulk at our expense, please let us know.